Train2Game Student studio and Make Something Unreal Live 2012 winners, Commando Kiwi, have released their first game on to the app store. The game, Warlock of Firetop Mountain: Lost Chapters, was created by the students in their spare time for last years Make Something Unreal Live contest, held by Epic. 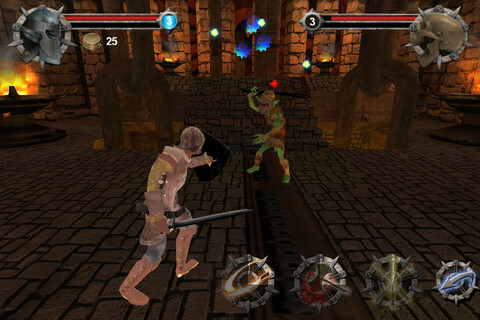 The game was created using the UDK software and is based on the very first Fighting Fantasy novel, Warlock of Firetop Mountain which was written by Ian Livingstone and Steve Jackson. The studio, which consists of Cat Forsyth, Martyn Whittel, Tom Chipchase, Jonny Robinson, Ashley Taylor, Adam Sherratt, Aaron Reeve, Andrew Smallwood, Tom Constable and Ezekiel Morris, have been working on the game since the beginning of 2012. The students won the competition after demonstrating their game to a number of industry professionals, including Peter Molyneux, Cliff Bleszinski and Jon Hare. The final descision was that of Ian Livingstone and Steve Jackson who decided Commando Kiwi’s game best captured the essence of Fighting Fantasy. The game is a third person action game which puts you in the shoes of the adventurer who is travelling through the deadly Firetop Mountain in search of the fabled treasure of the all-powerful Warlock. The game features enemies and locations from the classic book with a battle system based on the system from the book its self. The unique combat system based uses skill and luck combinations made famous by the series of novels in an intuitive Active Time Battle System. The game is available for free to download now from the app store.